Ok, now I’m a believer. My new Yoder YS1500 has been burned in, initially seasoned with 4lbs of bacon, and now finally with it’s first cook. 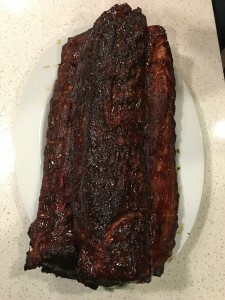 I used a Costco 3-pack package of babyback ribs and three different rubs for this cook. The first was a Chicken and Pork rub, a Sweet Rub and one of my favorite, Black Saskatchewan which is based on black pepper. Used the 3-2-1 method at 225 degrees for the 3, 250 degrees for the 2 and 350 degrees for the 1.